With Toronto’s mayoral election less than two months away, there’s a strong possibility that Jennifer Keesmaat, the city’s erstwhile chief city planner, will win. If she’s victorious on Oct. 22, expect transit to finally become a priority in a city that fancies itself a world stage player with the likes of New York and London. Where are the top 100 places to invest? Find out how in the next CREW. Keesmaat is perhaps the most high-profile city bureaucrat to champion the downtown relief line, and while incumbent mayor John Tory would like it built by 2031, his challenger believes it can be operational three years sooner. Tory campaigned on building SmartTrack, which Keesmaat would partially do away with if elected, but her plan appears more nuanced than Tory’s. In addition to the below-grade relief line, she’d enhance bus service, extend the Eglinton LRT to Pearson International Airport, build an LRT on Jane St., and make the King St. streetcar pilot permanent. Keesmaat’s plan also includes a few of the GO Train stops first proposed in SmartTrack. 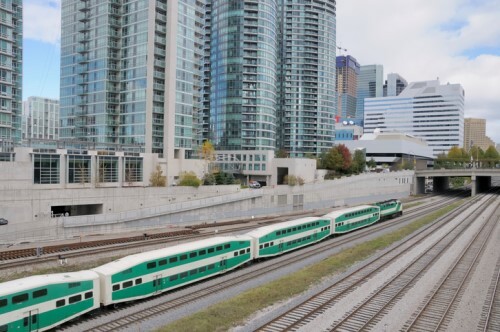 “Certainly her position on transit and the relief line—the relief line is critical, there’s no question about that, because it’s long overdue—she could bring a positive element to the debate insofar as integrating transit and planning together in a way that’s not been done before,” said Richard Lyall, the Residential Construction Council of Ontario’s president. As mandated in the Places to Grow Act of 2005, Toronto is intensifying, and a crucial component of those efforts is transit development. But while skyscrapers sprout in the city as quickly as weeds, the transit infrastructure needed to support them hasn’t materialized. Toronto is a chronically gridlocked city—both on its roads and at City Hall. A city designed for the automobile, it has committed itself to 21st century urban planning principles, but only ostensibly. Should it continue dragging its feet, Toronto will not join the exalted ranks of global cities. While she served as chief city planner, Keesmaat publicly butted heads with Tory over transit in a rare display of open defiance. It is only fitting, then, that the two clash in a high-stakes election that will determine whose vision for Toronto is realized.